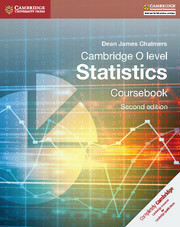 Cambridge O-Level Statistics develops the use of statistical techniques through a skill-building approach. Cambridge O-Level Statistics uses a skill-building approach that encourages the application of knowledge to a range of statistical problems. The coursebook provides learners with the opportunity to practice and consolidate the skills required of the Cambridge O Level (4040) syllabus, while understanding the ideas, methodology and terminology used in statistics. Extensive practice exercises to build confidence in statistical techniques. Clear worked examples to help students understand the concepts required for Statistics.